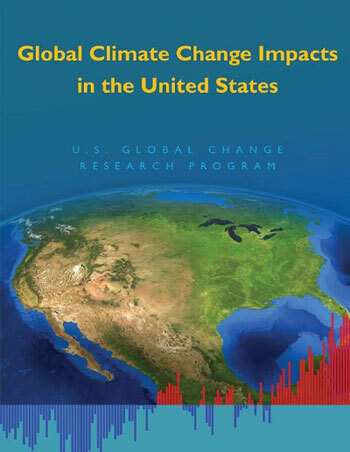 The White House has released a comprehensive assessment of the impacts of climate change on the United States. Congress mandates these reports are to be created every four years, but no reports were issued during the presidency of George W. Bush. President Obama has made up for that, with a 1,300 page report written by 300 leading scientists and experts, the third such report created. The assessment is expected to shape the environmental strategy for the last two years of the administration. Already, President Obama has signaled he will work to reduce carbon emissions from coal power plants, as the Supreme Court has just given the administration clearance to use the Clean Air Act to limit emissions because they cross state boundaries. Higher temperatures in the southwest are expected to create more droughts and lead to larger and more frequent wildfires. Meanwhile, “the north-east, midwest and Great Plains states will see an increase in heavy downpours and a greater risk of flooding.” Along the coasts, the threat of flooding will be particularly severe: “Residents of coastal cities, especially in Florida where there is already frequent flooding during rainstorms, can expect to see more. So can people living in inland cities sited on rivers.” Beyond flooding, sea levels will be inching up. The report covers impacts for each region in detail. For the mid-atlantic, which covers the District of Colombia, Maryland, and Virginia, there are potentially scary impacts. “As sea levels rise, the Chesapeake Bay region is expected to experience an increase in coastal flooding and drowning of . . . wetlands.” The Washington Post writes these wetlands are crucial for protecting against storm surges, so this development would be “especially bad because the lower bay region is at higher risk as a result of sinking land. Water quality would decline and low-oxygen ‘dead zones’ would increase.” And if there are even higher greenhouse gas emissions, much of the area is expected to get an additional 60 days of weather topping 90 degrees, starting around 2050. Extreme weather will test the country’s collective resilience in ways never seen before. The agricultural sector will need to adapt to hotter temperatures and more limited access to water. Higher temperatures will tax energy systems in the summer, as people crank up air conditioning. Health system will be tested, as more cases for asthma and other respiratory disorders increase with higher street-level temperatures, which exacerbate the worst effects of air pollution. Stormwater management systems will need to be redesigned to account for heavier and more frequent downpours. And natural coastal systems will need to be bolstered against sea level rise. The goal of the report is to no doubt raise awareness of climate change as a real problem. According to a Pew survey conducted last year, Americans continue to be an outlier in how they rank climate change as a threat. Only 40 percent of Americans see climate change as a danger, while a majority of every region of the world does (except for the Middle East). Read the report, and check out the innovative and positive adaptation efforts cities and communities are already undertaking. Philadelphia is highlighted for its game-changing green infrastructure program. Also, explore ASLA’s comprehensive resource center on climate change.